Who the hell is Dare.Win ? Matt is a freelance social and digital media consultant. Previous clients include BBC, ITV, United Nations, International Red Cross. Prior to working as a consultant, Matt was Director of Social Media at global technology news and events company The Next Web (TNW), and a digital communications expert for the UK Government. While at TNW, Matt was responsible for creating and implementing its editorial social media strategy to engage with a global audience of over 10 million readers, and 5 million social followers. He also developed the strategy and led a team of 15 people to deliver the social media output for one of the world’s most popular tech festivals, TNW Conference, which generated 450+ million social media impressions in 2017. Matt frequently appears on BBC News (TV/Radio), Sky News, NBC Europe and other channels as a social media industry commentator. 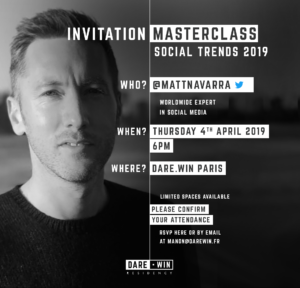 THE mondial expert in social media industry, Matt Navarra, is coming to Paris and will be part of the Dare.Win Residency. He will do a meet-up at the agency on Thursday 4th April, 2019.